Happy first day of fall! It is officially Pumpkinland time at Linvilla Orchards as we welcome in autumn after a long, hot summer. Linvilla is kicking off the season with some of the best family activities in all of Delaware County. 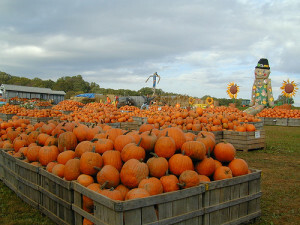 Pick the perfect pumpkin with over 100 tons on display and try your skill at their apple slings and pumpkin ring toss! If you’re up for the challenge, don’t forget to stick around for the haybale and corn mazes, and then take a ride on one of Linvilla’s classic autumn hayrides through the orchards. Pumpkinland will be open from September until early November, so there’s no excuse for missing out! For more information on each event and for hayride times, visit www.linvilla.com. Linvilla Orchards is located at 137 Knowlton Rd, Media, PA, 19063. ← Whiskey Bonanza at The Tail!